Influenced by the primitive qualities of outsider art and children’s art, Anna Torma creates large-scale hand embroideries. I just stumbled across her work as I’m doing research for my thesis. Browsing through her website, she seems to have quite a bend towards story-telling in the work and draws from life with titles like: Playground I – VI, Memoirs, and Storytelling. With a lot of images on her website, take a quick break and have a look! It’s Friday, take your time and browse! As mentioned in the previous posting, I (Karin) am having my thesis show in a couple weeks!! The journey towards my thesis began almost 4 years ago, in September 2005, when I packed everything that could fit into my car and drove to Savannah. It is hard to believe that I am now just a couple weeks away. The cards are at the printers, the work is (almost) done, the gallery is booked and I’m excited!! If you are in Savannah, the show opening will be June 26 from 6:00 pm- 9:00 pm at TruSpace Gallery, 2423 De Soto Ave. I would love to see you there!! Karin has booked her thesis show -hooray. June 26, 2009 at TrueSpace Gallery in DeSoto Row. Karin has also accepted a position as a fibers professor teaching at a university in Korea. She has just returned from her interview and has about 7 weeks to wrap up her thesis and her life in Savannah before this exciting new adventure begins. Go, Karin, go! Rubi must go abroad for a few months to earn money for embroidery supplies. But here is the good news. Stitch Spectacular will live on, now we will be coming at you from two global perspectives. You may not see much of us over the summer, but WE PROMISE to come back at you after labor day (without white shoes). FYI- Joann’s, my favorite place to wait in line to be helped by people who have no idea what they are doing, is having a sale on DMC embroidery floss this weekend: 29¢ a skein. The sale continues until Monday night. Stock up, y’all. My bad, the sale is from May 22-25, which is Memorial Day weekend, which I only learned is not this weekend–after I picked out about 40 skeins. Long live the ding dongs! Ya I want the Cheezy Poufs! No, really, this is a sample of a sampler. I am guessing it represents about 40 hours of my time, blissfully spent listening to chic indie rock outside, smelling jasmine on my back deck. This is hard work, on 25 count linen it means every square inch represents 1,250 actual stitches. By this math, the above sample is 3,024 stitches. When I drink water, it spurts out my fingertips like I am a sprinkler. The actual piece will be larger and take forever to complete. It is from this photo, which I took at a big membership store two years ago and have been trying to make art from since. I think it is hilarious. My goal is to complete the piece (I am guessing it will take a few months) without a cheeseball passing my lips. The color is quite seductive. Timing being everything, this article by Rob Walker appeared in yesterday’s New York Times magazine. I usually read it online on sundays, but I was so focused on finishing my sample I didn’t get to read it until today. It’s like a dairy fairy sprinkled cheesedust and made the whole world a bit more naturally cheese flavored (with artificial flavors). One great thing about being in school: guest artists! Last week SCAD welcomed Natalie Chanin of Alabama Chanin to give a lecture, present her work and visit with students. It is always inspiring to hear someone speak with passion and truly believe in the work they do! With a focus on slow design and sustainability, all garments are hand stitched and constructed by individual stitchers in rural Alabama. The fabrics are lovely and the garments are absolutely stunning!! Her website has loads of images for inspiration!! If you’re dying for something in print you can get your hands on a book: Alabama Stitch Book. And if you MUST have one of these garments by cannot afford the price, check out their website for instructions and fabric! Fellow stitchers, an important question: Do you wash your work? To be honest, I am terrified of washing mine. My younger sister created a cross-stitched lobster in art class in high school. When she washed it to block it the color ran. Mr. Lobster has been hanging in the kitchen for over fifteen years in a haze of red, underscoring my belief that water will ruin my precious projects. In full disclosure, I am no laundry queen, as my husband’s wardrobe of slightly pink t-shirts proves. I am only a few stitches away from finishing a piece, worked in black thread on white linen, and will be ready to frame. I would love to get the crispness back in the fabric, but can’t bear to see my efforts float away like clouds of errant dye in a water bath. It might be nice to get the curry paste stain out, as well (bad Rubi!). 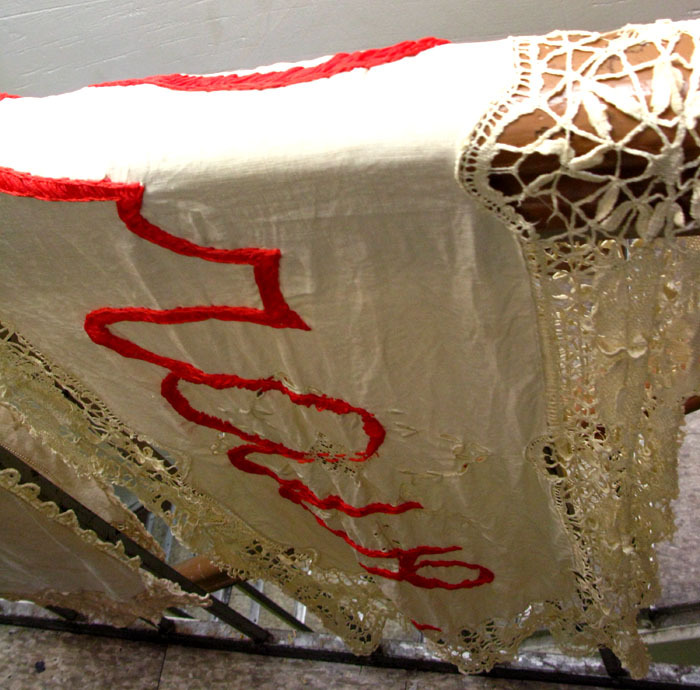 I read this post by Joetta Maue, with pictures (above) of her wet needlework drying and thought “Brave” is a fitting title. So, please weigh in, do you wash your pieces? Have you had a bad experience with dye running? What products do you use?